Offering free Wi-Fi and a TV in every guest room this Urbana hotel is adjacent to Busey Woods and 1.6 km from the University of Illinois. Free coffee is served to guests in the morning. 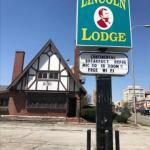 A microwave and a refrigerator are included in each guest room at The Lincoln Lodge Urbana. A work desk is also provided in every room. The reception desk is available 24-hours a day at Urbana Lincoln Lodge hotel. Vending machines with both snacks and drinks are featured on site. Urbana city centre is 10 minutesâ?? walk from this lodge. The Illini Union Kam's and the Beckman Institute for Advanced Science and Technology are 5 minutes' drive away. Champaign city centre is 3 km of the property.